To the general public, driving a forklift may not seem like an especially dangerous job. You tool around a warehouse in a low-set, sturdy vehicle. You put pallets and boxes on and off shelves. And you make a beeping noise every time you back up. But those who drive a forklift for a living know it’s a risky business, where even a slight mishap can result in serious injury or death. Just ask Dustin Ventimiglia. A forklift driver for Veolia Environmental Services, Dustin almost lost his life when his forklift rolled over and nearly crushed him to death. Dustin liked his job and earned a good wage at Veolia. But he also had dreams of becoming a professional MMA (Mixed Martial Arts) fighter. Dustin enjoyed wrestling from a very young age, and as he grew older his passion for the sport never waned. When he discovered MMA fighting, his direction in life was set. Dustin began fighting at the amateur level to develop the skills and experience needed to compete as a professional. With each fight, he grew closer to his goal. Then, the unfortunate accident happened. A certified forklift driver, Dustin was well-versed on the importance of safety and awareness on the job. However, one evening while working the night shift he learned that even experienced forklift operators can make mistakes. 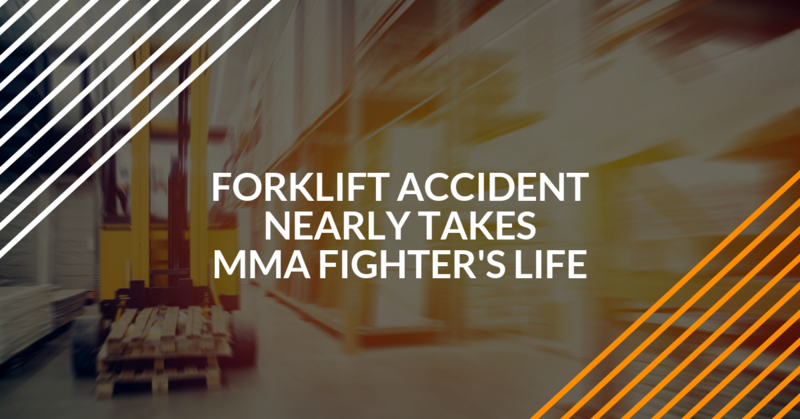 While carrying waste material for disposal, a job he had safely performed hundreds of times, Dustin operated his forklift at an unsafe speed. Nothing reckless, but just enough to make the vehicle unstable while making a sharp turn. During the turn, the forklift’s tires caught on the floor, causing it to overturn. Dustin fell out of the forklift. The forklift landed on top of him. His life was changed forever. The average warehouse forklift weighs between 5,000 and 10,000 lbs., all of which landed squarely on top of Dustin. Fortunately, Dustin’s co-workers responded immediately. They managed to pull him out from underneath his forklift by lifting it with another forklift and called an ambulance to rush him to the hospital. Otherwise, he probably wouldn’t have survived. Dustin’s most serious injuries were internal. Damage to critical veins and arteries were so severe he nearly bled to death on the way to the hospital. Other injuries included eight broken ribs, four crushed vertebrae, two collapsed lungs and a lacerated liver. He also suffered two broken femurs and three fractures in his right leg. His spleen was so badly damaged it had to be removed. Due to the extent of the injuries, doctors placed Dustin in an induced coma for nine days. They wanted to make sure they had found and treated all the internal damage, and they wanted to give his body time to start healing. When they slowly brought Dustin out of the coma, it took longer than usual due to his liver damage. As he lay in the hospital for weeks, Dustin wondered if he would ever drive a forklift again, much less return to MMA. It takes courage, determination and resolve to become an MMA fighter. Fortunately, Dustin has no shortage of those qualities. A little more than a year after the accident, Dustin began preparing for his next MMA cage fight – an accomplishment that surprised everyone but Dustin. Dustin’s body no longer consists of a mass of broken bones and ruptured organs. Instead, it is once again the physique of a well-toned athlete. It doesn’t look anything like the body of a man crushed by a vehicle more than 20 times his weight. However, underneath Dustin’s shirt, a long row of scars from the staples used to hold him together runs from his navel to his sternum. And if you glance just below his right eye, you’ll notice what appears to be a poorly done tattoo. Instead, it’s a piece of asphalt where bits of the floor remain stuck in Dustin’s face. Dustin may have recovered from his horrific accident, but he will always bear the physical reminders of it. Fortunately, this story has a happy ending. Dustin recently won his first amateur MMA fight since recovering from his forklift injuries, and he is continuing to chase his dream of becoming a professional fighter. He has returned to work at his forklift job to support his family until he turns professional. Dustin knows he is lucky to be alive. The moral of the story is that forklift safety should never be taken lightly. Every year, more than 68,000 forklift accidents occur in the U.S., some resulting in fatalities. To reduce this dangerously high number, drivers need to be trained on the specific forklift they use. In addition, both drivers and warehouse workers need to be trained in pedestrian safety. When forklift safety becomes a team effort, everyone is safer. Learn how to get your warehouse team OSHA compliant today!